Journal of Research and Practice on the Musculoskeletal System is a peer-reviewed, open access journal published by Hylonome Publications. The Journal focuses upon all the aspects of clinical and basic research related to musculoskeletal system. 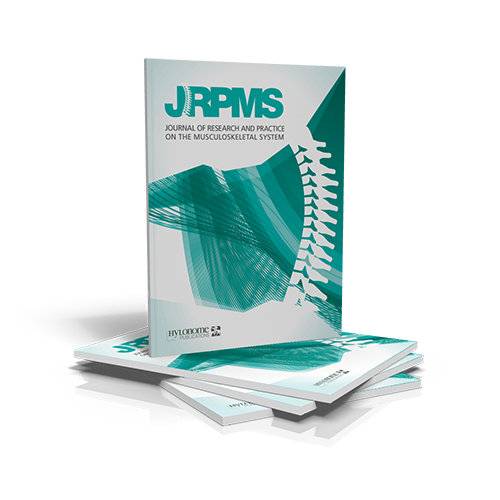 JRPMS provides easy access to high quality Manuscripts in all topics related to orthopaedic, diagnosis and management, as well as to musculoskeletal disorders and injuries. We aim to provide immediate and unlimited access to highest quality clinical and experimental content via open access platform. Original Articles, Reviews, Mini Reviews, Short Communications, Case Reports, Clinical Image, Perspectives/Opinions, Letters, Short Note and Commentaries for publication. All articles published in the journal are subject to a rigorous peer review process. 14th-16th December 2018, Thessaloniki, Greece.